Fetch is a fun trick that can be used for many different things. 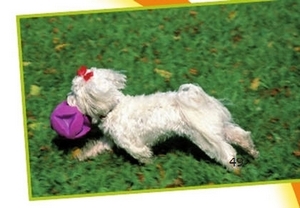 You can teach your dog to fetch the newspaper, a person, speciﬁc objects—pretty much anything goes! If you want your dog to fetch the newspaper, you need to get him used to holding it. take it from a person’s hand. Gradually increase what he has to do to get a click until he is picking the newspaper up off the ground. Next, take a step or two back and put the paper down. Send him to the newspaper with the same cue. If he gets it and brings it to you, click and treat and have a party. Repeat several times. 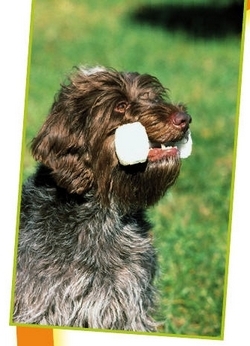 Gradually increase the distance you and your dog are from the newspaper when you send him. If your dog doesn’t want to bring the paper back to you, try upgrading from your usual training treats to better treats, like leftover steak. If the reward is good enough, he’ll come to do a trade. The key to getting your dog to fetch different objects is to name each object for him. That means each object has its own slightly different cue. My dogs all know the word “ball,” so when I tell them “get your ball,” they run off to ﬁnd a ball and bring it to me. To teach your dog the name of something, say the name of the object each time you have him take it in his mouth. He will ﬁgure out that the purpose of the game is to match the name with the object, and that when he does this, he gets a reward. For example, when you ask him to “get my slippers,” you don’t want him to run and grab the newspaper. closer to the item you wanted so your dog is less likely to be confused. Fetching people is a fun trick. Dogs often learn our names anyway just from hearing us use them when talking with one another. To make sure your dog knows a person’s name, have that person join you in a training session. My dog then spends several minutes searching the house for me, and she gets quite upset if she can’t ﬁnd me. Sometimes when I get home, she launches herself at me with more than her usual excited greeting. Then I know that she has been searching for me and is thrilled that she found me.